How would one pare the world of children's literature, since its inception, down to only 1001 books every child should read? Certainly 1001 is a lot. This book is a doorstop, at its slightly-less-than-a-book-per-page format. But there is so much that is wonderful out there; how did the editor stop once she had reached her 1001 target? This is a very challenging, not to mention controversial, undertaking, to weed out and highlight the best and brightest in children's literature. I'm glad someone's done it because this book has been very useful to me and I see that continuing. 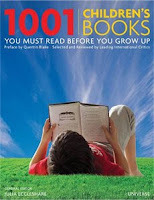 As the title suggests, this book provides reviews and synopses of 1001 recommended, quality children's books. It's arranged by age group, which is handy for those of us looking for recommended reading for kids of certain ages, and also for those of us looking for inspiration for kids' book clubs. Each age category (0+, 5+, 8+, and 12+) is arranged such that the earliest books are first, and the later books go right up to 2008. There are several different reviewers, and each review talks about the book in question as far as plot, why it's good, and where its place in the world is. Some of these reviews are better than others, but most do well within the word count they are given. Two things in particular really struck me as really valuable about this book: first, it's very international; and second, there are a lot of older and relatively obscure books represented here. Both of these things are nice, because while I feel I have a pretty decent grounding in children's literature, I certainly don't know a lot of the international titles and there are a lot of obscure, older, but definitely foundational books represented here. I have been able to use it to remind myself of some of the "classics" both old and new that I'd like to look at with my book club groups. There are a couple of things that bother me about this book, too. As is inevitable with lists of this sort, things get included and others get left out. I think it's a good exercise in itself to think about why certain things show up and others don't. For one example that cast the entire selection process into doubt for me: Twilight. Really? Everyone should read that? Really? I mean, I know the book is a phenomenon, and that it has changed the face of YA literature, but it's just not that good. Its "readable" quotient is high, if one isn't put off by the writing or the characters, but if "readable" was the criteria, I would have expected to see more Meg Cabot and Sarah Dessen and Maureen Johnson and Norah McClintock and John Green, just to name a few for that age group, none of whom were included. And there are a lot of series that get double-listing -- the Harry Potter books, say -- where probably listing the first one would have been enough, with a "this whole series is excellent/gets better/etc." statement, rather than taking up valuable space on the list. The other quibble I have is a little more practical. None of the listings include a page count. This is exceedingly irritating, particularly in the "8+" section where both picture books and early chapter books are included, and where books for that wide range of reader ability are included, too. Actually, as nice as a page count would be, even a "this is a picture book" would probably have been enough. As it is, it's really not always clear from the review. When using this book as a tool for reader's advisory or book club book selection, that kind of information is extremely important. Further, instead of a page count, we get "themes" which can be useful, I suppose, but are subjective and often more useful to the person thinking them up than the person reading about them. Though I guess that if I were looking for a book on a specific theme, those tags might be handy as a starting point. I just tend to resist classifying things too tightly (she says, and then eyes her blog sidebar and sighs.) At any rate, you'll notice that from now on, I'm including page counts on my reviews. And publisher and author info. I'd be rather a hypocrite if I didn't start. Overall, I think this book is worth a look if you have any interest at all in children's literature. It has some very interesting stuff in it, some of which I'm sure is exceedingly challenging to find (the older translations, for example? unless they're widely-accepted classics, good luck.) It's not a perfect list, but it's a good one.